This page covers advantages and disadvantages of SRAM. It mentions SRAM advantages or benefits and SRAM disadvantages or drawbacks. 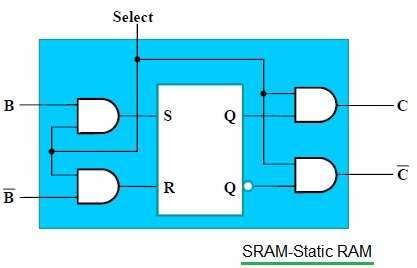 SRAM stands for Static Random Access Memory. • SRAM uses array of storage cells. • Information is stored in devices known as latches usually SR.
• It is used in computers, mobile phones, automotive electronics, electronic toys etc. Refer SRAM vs DRAM vs MRAM >>. ➨SRAM performance is better than DRAM in terms of speed. It means it is faster in operation. As a result, it takes less time for accessing data or information compare to DRAM. ➨It is used to create speed sensitive cache. ➨It has medium power consumption. ➨It is costlier compare to DRAM. ➨It is volatile i.e. data is lost when memory is not powered. ➨It is not possible to refresh programs. ➨It has low storage capacity. ➨SRAM has more complex design.